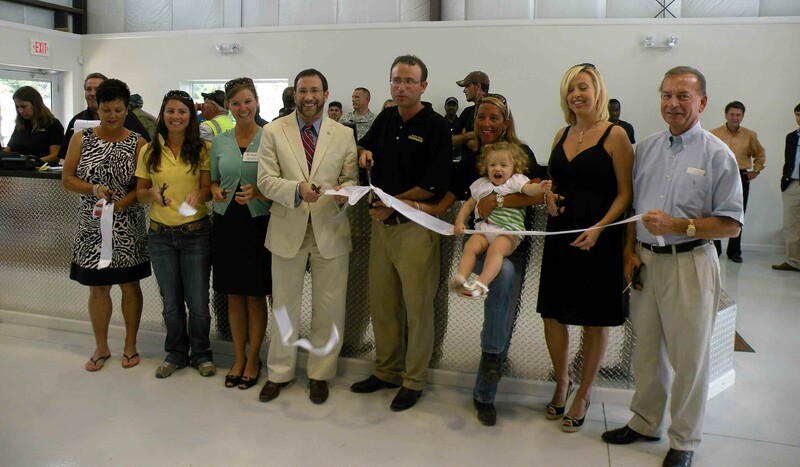 Kenny Grainger, President of Savannah’s Cash-n-Carry used auto parts and self-serve salvage yard, and its employees proudly held the grand opening of a new 4,200 square foot customer service building. A ribbon cutting ceremony was held on May 27. The event will also served as a customer appreciation day where customers enjoyed free admission to the salvage yard, free food and had a chance to win a car through a raffle. Free hamburgers and hot dogs were available for customers. Grainger and his staff wanted to create a unique shopping experience at their automotive salvage business. What the staff came up with is something different from the commonly known junkyard: A safe, clean and environmentally friendly self-service yard full of vehicles ranging from the 1970s to 2007. The goal for Grainger and his 14 staff members is to handle the needs of their customers in a fast, professional, and friendly manner. The new building will aid the staff in doing so as it has designated areas for retail sales and a kid-friendly waiting room. Left -Right: Terry Grainger, Ansley Grainger, Chamber Ambassador London Mainor, Alderman Jeff Felser, Kenny Grainger, Latisha Grainger along with Grace, Pam Grainger and Ken Grainger participate in ribbon cutting. can walk into a 1,400 square foot retail sales office – a space Grainger said is large enough to handle the hundreds of people who walk through the door every day. The building will also house a kid-friendly, comfortable waiting area with soda and vending machines. Cash-n-Carry is a selfservice salvage yard that has been serving Savannah and the Low Country since 1985. The family-owned business sells premium auto parts at low prices. The environmentally friendly and clean business recycles every part of every vehicle they receive by allowing customers to bring their toolbox and pull parts from over 1,500 cars, trucks, and SUV’s on the lot. Once a vehicle is dismantled the remnants are then crushed and recycled. Cash-n-Carry, located at 500 Staley Avenue in Savannah, is open 7 days a week for their customer’s convenience. To learn more about Cash-n-Carry go to www.iluvused. com or call 912-352- 0725.